Every day, we do things that makes our skin and bodies and overall health worse and may cause us to age in the process. These things range from the foods we eat to how we dress and to the the places we go to. These things makes us look older than we actually are. 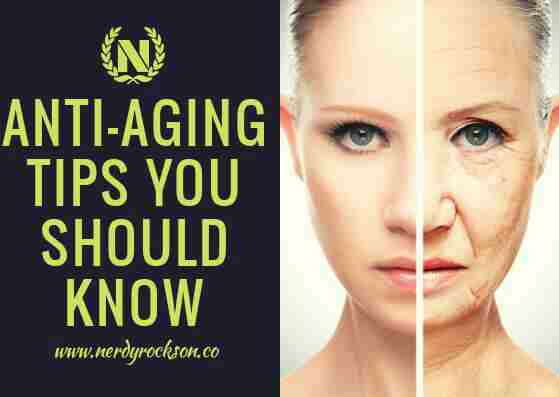 To help avoid this, here are some anti-aging tips you should know. Drinking water regularly throughout the day can help you maintain healthy skin. Insufficient water consumption can cause appearance of wrinkles and lines and cause dry skin. Drink enough water to keep your skin glowing and healthy. Gaining excess weight or being overweight can actually make you look older than you actually are, and not in a good way. Weight gain around the face may cause sagging, adding years to your appearance It’s best to avoid gaining any extra unneeded weight. Repeated cases of sunburn may increase your risk of skin cancer as you age. Focus on preventing sunburn by using adequate sunscreen and wearing protective clothing when you’re going to be exposed to sun. What most people don't know is that sugar not only rots your teeth but also contributes to a loss of skin firmness, causing your skin to age. Instead of sugary foods, go for a diet with good lean protein, fruits and vegetables and stay away from added sugar. I never knew this until my mum told me about it. Staying up all-night can also make you look older than you actually are. Sleep helps your body heal, detoxify and balance hormones. It also helps improve circulation around your eyes to decrease puffiness and dryness. Not getting enough sleep can this make your body look worse for wear. These anti aging tips are advice from professionals and you try as much as possible to always take note of the tips above. These tips are really helpful, you should try it. If you find these tips helpful don't forget to share and let us know what you think in the comment section below.